We always hated how grimy our master bathroom shower stall would get a week or so after cleaning the shower. To remedy this, we started to buy and use daily shower sprays. But I wasn’t a fan of buying the sprays because the more green brands are obviously more expensive, and the more inexpensive brands seem to have a million chemicals in them. So I decided to whip up a batch of my own cost effective DIY daily shower spray. Just call me Martha Stewart. Although Martha would probably tell you to put 5 halved lemons that have been soaked in vinegar and sprinkled with dried saffron on the bottom of your shower stall while you shower. Or something like that. Instead of making a bottle at a time, I decided to whip up almost a gallon of the daily shower spray. I mean, since I had all the ingredients out, I figured I might as well make a big batch. We use distilled water in Owen’s nursery humidifier so we always have endless plastic gallon containers, so I grabbed one out of our recycling bin and took off the label. 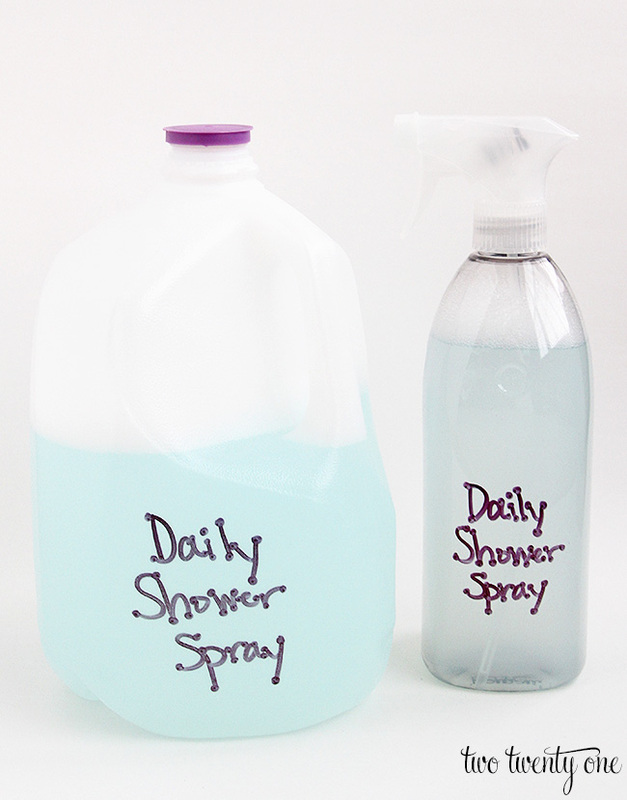 Instead of shelling out more money for a spray bottle, I used our last store-bought daily shower spray bottle. With a little Goo Gone and elbow grease, I was able to get the label residue off. 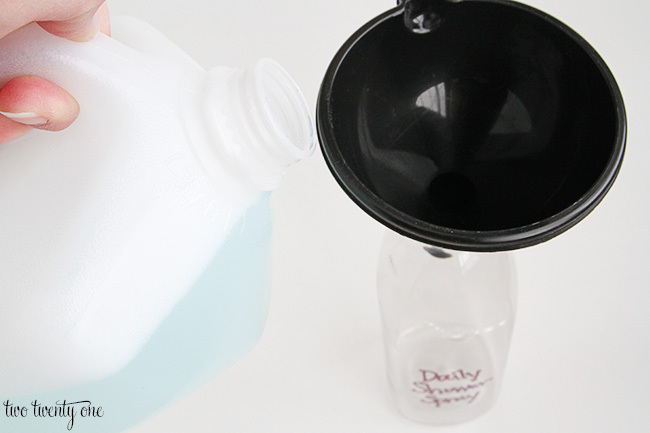 I use a dollar store funnel that we keep under our kitchen sink to pour the cleaner into the spray bottle. 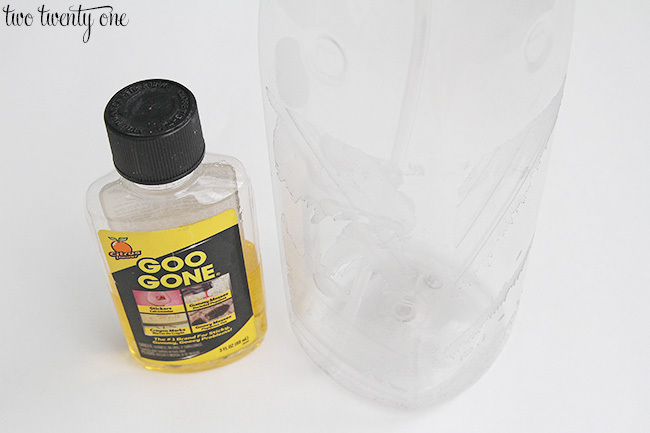 Using a funnel, pour all the ingredients into a gallon container. Put on the cap and shake. Spray the daily shower spray on your shower surfaces after showering. No rinsing or elbow grease required. This makes about 14 1/2 cups of cleaner. The lemon oil, which is said to have disinfecting properties, helps hide the vinegar smell. You know, so your bathroom doesn’t smell like salad dressing after spraying the cleaner in your shower. I could’ve been a fancy blogger and made custom vinyl labels for the bottles but I don’t have time for all that so I busted out a Sharpie to label the bottle and gallon refill jug. 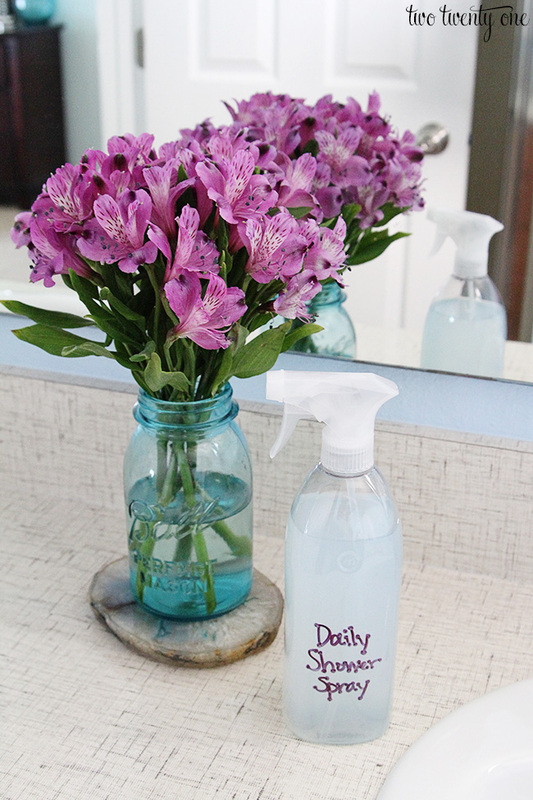 We’ve been using my daily shower spray for a couple weeks, and it seems to be working just as well as the store-bought sprays. Yay for not having to deep clean our shower stall as often. Do you spray while in the shower or after? Do you let sit or rinse off? With most daily shower sprays, like this one, you spray it on after the shower surfaces after showering and leave it. Awesome! I have never thought of making my own! It’s so easy to spray on right after you hop out of the shower. 5seconds and you’re done! Hah! Jump on it! I love using it because it means I don’t have to scrub the shower as often. I can’t wait to try this!! Do you think any scented oil would work or does it need to be lemon oil? I think any scent would work. I just like the smell of lemon, and it’s been said that lemon oil is a disinfectant. What a great idea! 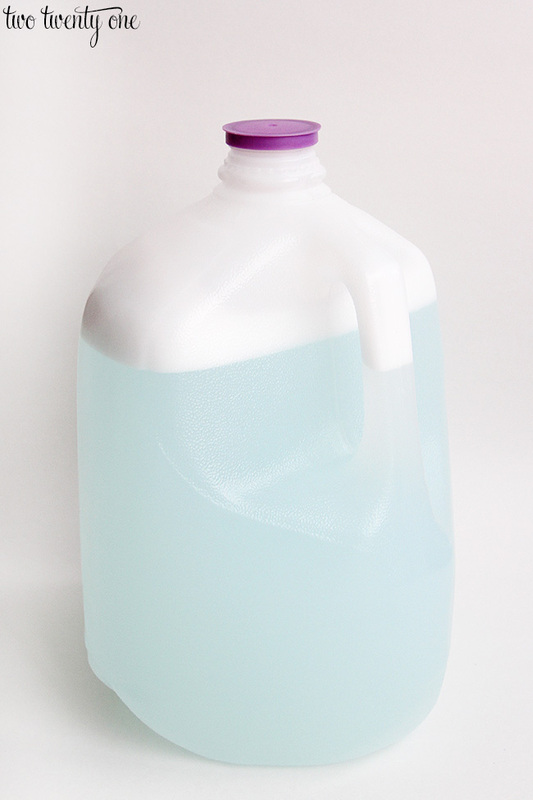 I am always looking for chemical free ways to switch over cleaning products in our house. I will have to give this one a try. With kids it is amazing how time just becomes a thing of the past lol. 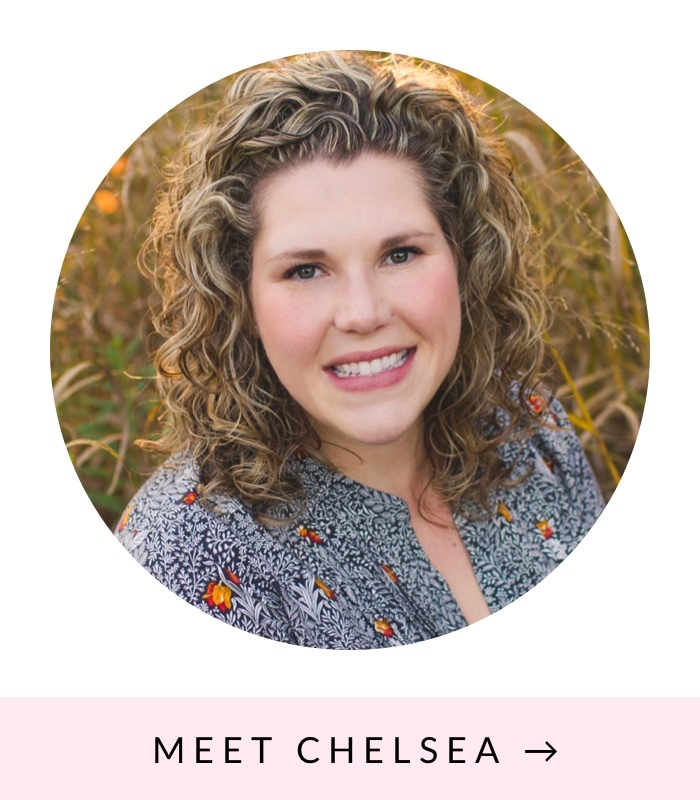 Thanks for sharing on Inspire Me Monday. I hope you have a wonderful week!! I’m going to have to try this! So glad that you shared this on the #HomeMattersParty Keep coming back! How well does this work on hard water spots and mold in the grout? It’s just a daily shower spray to keep those things at bay. It’s not meant for deep cleaning. 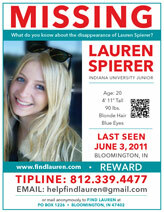 So glad I found this! I just cleaned my shower today and after a week it was horrible. I have been thinking of going back to these daily cleaners, but couldn’t do it with the chemicals. This is perfect and almost the same mixture as the cleaner I use for the shower (vinegar and dawn). That stuff makes cleaning it not so bad, but this would make it awesome! I’m going to try it!! What are the measurements for a 32 oz recipe?